The Dutch Mountains. 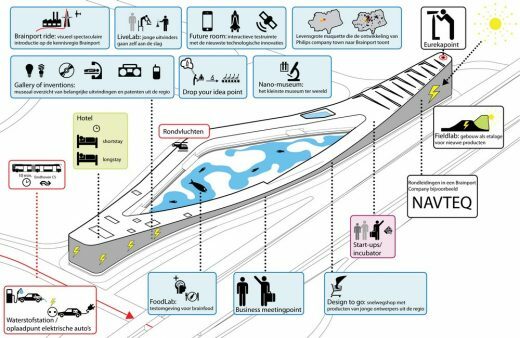 The interactive work and residential environment of the future; a multi-purpose facility on a mission. An ultra-circular structure capable of changing along as time passes, and capacitated for improvement though updates, upgrades, and possibly the occasional downgrade as well. The Dutch Mountains are the embodiment of a services economy, and as such, the project encompasses the development of an all-new model of utilisation and organisation. Lighting, heating, nutrition, furniture, utilities, facades, and soil; these are all considered services within the system of The Dutch Mountains. The Dutch Mountains are to be the focal point of Eindhoven Brainport, The Dutch Mountains are home to the Brainport Experience Center, a regional and international showcase and platform for applications of all sorts of now, new & next technologies conceived at the Brainport. The Dutch Mountains also serves as a network name denoting an open collaboration between regional organisations and innovative multinationals, united through their common progressive bearings. Together, they have plotted a course intent on taking the world by surprise through a new perspective on genuine sustainable development, taking Eindhoven Brainport for its starting point. What’s so special about this development? A host of different aspects make this development stand out from among its peers. In a sense, The Dutch Mountains are erected around their future users as a group. A central tenet of the project is the development of a smart ‘services ecosystem’; a comprehensive package of services constituting the ideal life, work, and residence environment for its users. Service providers that would usually only be involved in the final stages of any ‘regular’ property development project are wrapped up into the trajectory from the very outset. Moreover, even at this early stage, the project enjoys the commitment of facilities and IT companies capable of optimising service experience to maximum effect. 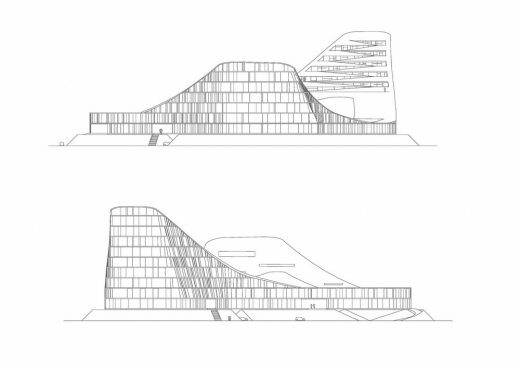 Rather than the building as such, future user experiences serve as the project’s point of departure. As the services ecosystem improves over time, it will continue to determine the implementation of the enveloping structure’s design. This design is equipped to embrace the comfort of living, work, and residence to full effect. The building has to be able to cope with ongoing sequences of updates and upgrades, as well as the occasional downgrade that may become evident as the future unfolds. 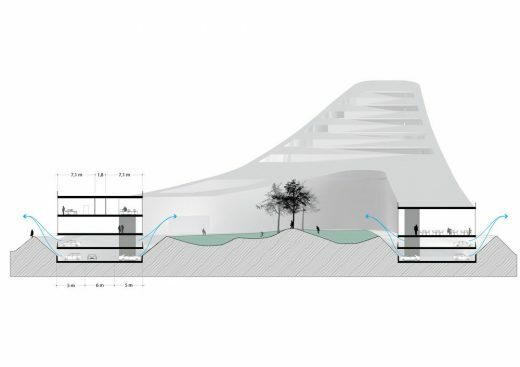 The Dutch Mountains consist of mutually complementary and supplementary services not just within the building, but all across its exterior surface as well. Lighting, heating, nutrition, furniture, facilities, and even its facades and floor surfaces; these are all services in the system comprising The Dutch Mountains. This allows for replacement of software as well as hardware over the course of time. 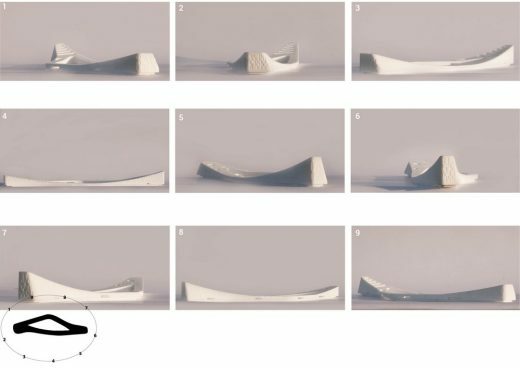 An example: if a few years from now, a smarter type of facade enters the market, generating greater energy outputs than its predecessors, The Dutch Mountains must be capable of replacing existing versions by more advanced counterparts. This calls for an all-new model of utilisation and organisation. Development of just such a model – coined ‘building as a service’ – is an integral part of the project. Using the method of operation described above, the project partners intend to use the enterprise to set a new standard for sustainable development. A building that improves over time revolutionises not just the playing field, but changes the game itself. The ‘building as a service’ principle is meant to ensure that the structure can be adjusted to (new) climate and ecology objectives at any moment. Moreover, The Dutch Mountains must be optimally self-sufficient from square one, featuring complete cycles to govern flows of power, water, waste, and materials. The diagram presented below translates this objective into an initial outline of the concept. 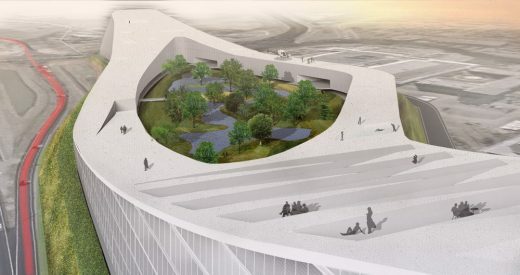 A host of high-tech companies and institutes dotting the vicinity of The Dutch Mountains have joined in the push to realise the ambition embodied by this grand alliance: making the most circular structure imaginable a reality. The Dutch Mountains constitute a habitat that offers a place to work and to dwell; to encounter and to relax. It is an attractive and inspiring work environment for knowledge-intensive enterprises. The structure accommodates a hotel with short and long stay facilities. 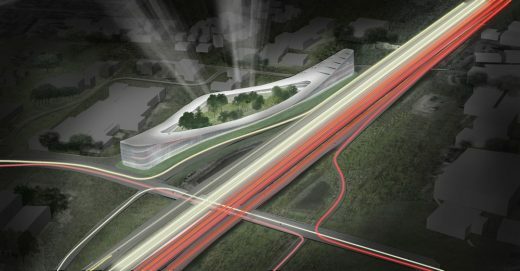 This is an Experience, transforming the Brainport into a visible and tangible sensation. 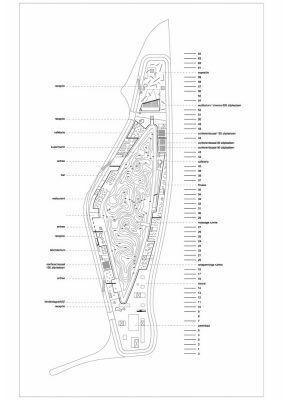 Enclosing a park that is open to the public and governs water retention, this is a village in and of itself, with 24-hour dynamics and publicly accessible facilities including restaurants, cafés, health club, child care, and a supermarket. This is a place users can identify with; a place to take pride in. Parking facilities cover two decks, one of which is submerged to about 1.5 metres below ground level, amounting to a (maximum) total capacity of approximately 1,500 parking spaces. In addition to centralised parking facilities, users also have the option of parking directly underneath their individual offices. 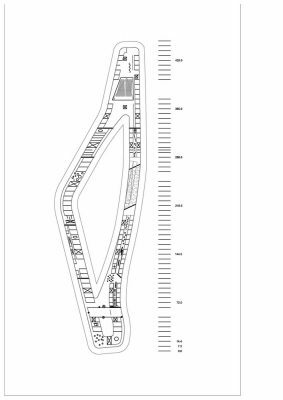 The parking decks feature daylight illumination and natural ventilation, and parking facilities are encircled by interior and exterior surface structures to hide any vehicles from view. This has the additional benefit of providing a green base surface for the glass structure suspended above it. Surrounded by surface structures and buildings, shielding it from outside noise, a spacious yet intimate park landscape unfolds. This park area, measuring 13,000m2, offers a place to unwind and a meeting point for employees, hotel guests, and residents from neighbouring areas. The park moreover serves as a buffer for precipitation, and is capable of metamorphosis on a regular basis. The main structural volume (over 30.000 m2) is occupied by office functions, laboratories, and hotel rooms. The number of prospective businesses as well as their distribution throughout the complex is highly flexible. The projections of the building are ideally suited for larger business operations, whereas the midsection offers great options for smaller enterprises and start-ups. All office spaces and hotel rooms provide views of the park and the cityscape. 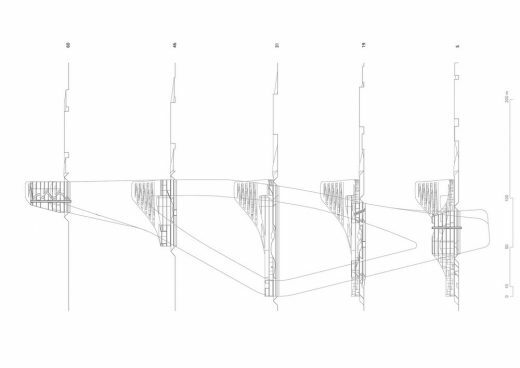 The roof functions like a ship’s deck, interconnecting the underlying functionalities. While the deck provides a superb view of the structure itself and the courtyard, the vista of the surrounding area is bound to compete for any spectator’s attention. At a maximum altitude of 45 metres, the summit of The Dutch Mountains is bound to establish a sensational vantage point over the city below. Scaling these Mountains right to the top has a reward all of its own: the sky restaurant, unmatched for its altitude in the wider region. The roof is accessible from all office floors and hotel storeys, which extends its functionality to a potential safe haven in case of an emergency. 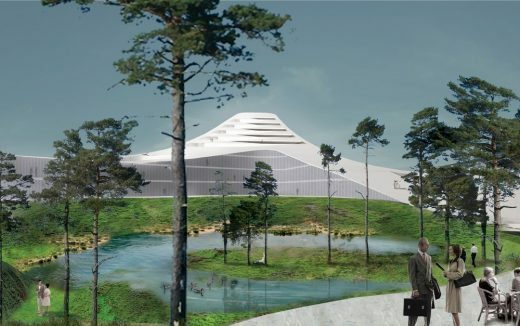 The Dutch Mountains will be much more than work environment alone: they will disclose a space where visitors and residents of the Eindhoven region can grow familiar with the Brainport phenomenon. 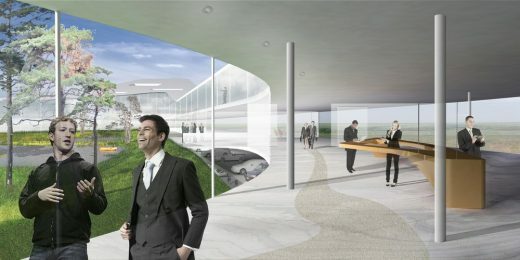 The Brainport Experience Center is set to become the showcase for the ‘smartest region in the world’. Here, local and regional businesses present themselves and their latest innovations. This will be a main meeting point for anyone visiting the wider area for business purposes. The lobby will be the chief accommodation of the Brainport Experience Center, which could harbour all sorts of ‘infotainment’ amenities ranging from a Brainport ride or a LiveLab to a FutureRoom. 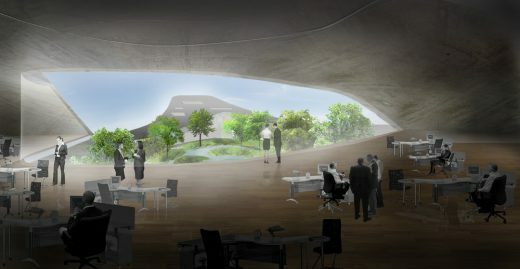 The building as a whole will serve as a field lab for innovative construction and energy technology, whereas the garden will be a sampling ground for Brainfood. How does this relate to the Brainport? The southeastern part of Brabant province is the most distinctive expertise and innovation region in the Netherlands, and as such, the Dutch national authorities have officially appointed it as a Brainport to demarcate its key position within the national economy. Comprising important bases of operations for sectors including High Tech Systems & Materials, Agrofood, Automotive, Lifetech, and Design, the area is ranked among the top of Europe’s innovation regions. This area represents a unique interplay of high-intensity expertise businesses, and high-grade production and development industry. Acquisition of prototypes and limited issues of highly specialist products in the immediate vicinity of corporations directed predominantly at design and research constitutes a considerable value boost for the project as a whole. These enterprises combine into a comprehensive chain stretching all the way from fundamental research to development, production, and marketing of products. The Dutch Mountains are to become the narrator of Eindhoven Brainport’s story, known as the world’s smartest region, allowing it to make a lasting impact on the international stage. Where will The Dutch Mountains arise? The intended location is De Run in the municipality of Veldhoven, situated at a high-visibility location verging directly on Brainport Avenue. 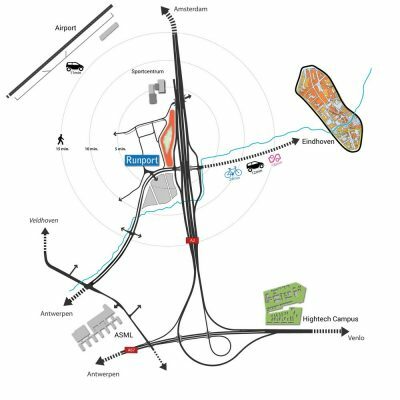 The prospective location has been determined in close deliberation with Veldhoven municipal authorities. On-site preliminary environmental inspections have been carried out, resulting in a clear perspective on the potential for opening up the area. Continuation of the process will result in a decision on the definitive location. A range of concept developers, designers, financers, service providers, and technology and facilities enterprises have decided to join forces. A development group consisting of seven partners has taken the fore: AAFM/Asito, BLOC, Dell Technologies, Honeywell Building Solutions, SPIE Nederland, Studio Marco Vermeulen, and Urban XChange. Arup, Eindhoven University of Technology, SlimBouwen Foundation. and Twice Eindhoven are expertise partners, as well as being a potential utilisation partner in case of the latter. The project was initiated by Brainport Development, with ongoing support form Veldhoven municipal authorities. Negotiations with further governing bodies, potential users, and investors are currently in full swing. AAFM, in its position of market leader, is the independent management and advisory organisation par excellence when it comes to sustainable facilities solutions. Its core activity consists of Integrated Facility Management, in which AAFM assumes integral responsibility for its principals’ entire facilities portfolio. Every day, over 300 professionals combine their efforts to serve a wide range of principals from public as well as private sectors. Arup has been active in the Netherlands since 2009, and as such, it is one of the most appealing engineering and advisory agencies in the world. Among other feats, they are the engineers behind Wembley Stadium, Centre Pompidou, and Sydney Opera House. Moreover, the enterprise is a ‘knowledge partner’ to the Ellen MacArthur Foundation, a prominent platform dedicated to circular economy. 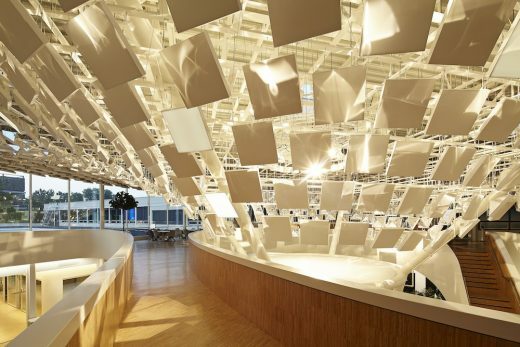 Asito, at 10,000 employees, is one of the largest cleaning companies in the Netherlands. In addition to its continuous focus on technological innovation and customer experience, Asito directs its efforts at making integration, diversity, and inclusiveness prominent issues for Dutch trade and industry. BLOC is a creative development firm: a next-generation developer. BLOC is initiator and developer of the Dutch Windwheel,; Rotterdam’s 174-metre-high icon of sustainability. In addition, BLOC has initiated and implemented a CO2 smart grid. 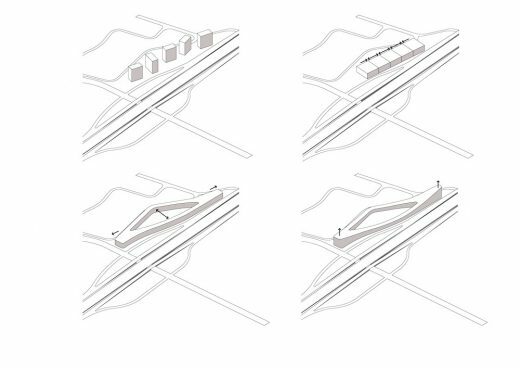 Furthermore, BLOC oversees the transformation of Het Dorp in Arnhem into a super-smart high care environment, as well as being the initiator of a smart city approach in Paris. Honeywell Building Solutions consists of a variety of dynamic divisions that are actively involved in developing innovative systems, products, and services for automation and security in industrial, residential, and structural settings. In addition to products for measurement and regulation technologies, Honeywell Building Solutions develops products for aviation, automotives, energy generating systems, special chemicals, synthetics, and advance electronics. SPIE Nederland is a subsidiary firm of SPIE Group, the independent European leader in the field of multi-technical services pertaining to the fields of energy and communication. SPIE Nederland guides its customers through development implementation, utilisation, and maintenance of network systems and energy, infrastructure, industrial, and structural facilities. SPIE Nederland is ranked among the top three technical service providers in the Netherlands. Slimbouwen Foundation for smart building is a platform spanning the entire breadth of the construction sector of and for participants; these are innovators actively engaged in a reset of the construction process as a whole. Slimbouwen Participants are renowned for their innovative, progressive, and socially committed mindset. Slimbouwen organises inspiring brainstorm sessions, matchmaking meetings, excursions, conventions, and network sociables, in which open events serve as a meeting place for participants. 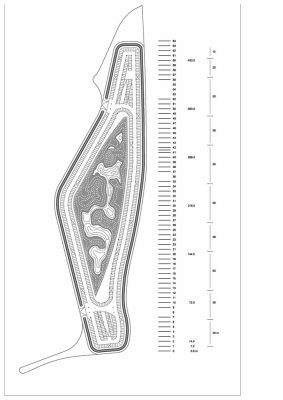 Studio Marco Vermeulen is a designer’s agency for architecture, urban development, landscaping, and research. Innovation and the completion of cycles are central to most of its projects. 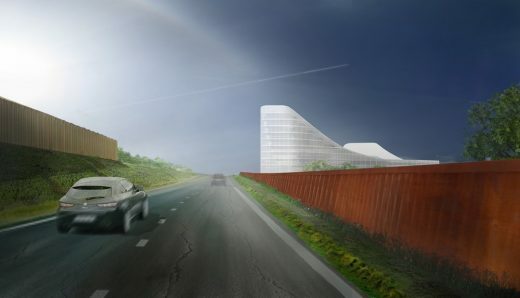 In the past, Marco Vermeulen has developed a spatial strategy for the Brainport (“The Brilliant Landscape”), an outlook for Brabantstad 2040, and a spatial design for the Lifetech Campus by ASML and MMC. Studio Marco Vermeulen recently won three Architizer Awards for their high-profile Biesbosch Museum. Eindhoven Technical University (TU/e) is a research university specialising in engineering science & technology. Through education, research, and knowledge valorisation, TU/e contributes to: (1) science for society: resolving major social issues and increasing wealth and welfare by focusing on the Strategic Areas of Energy, Health, and Smart Mobility; (2) science for industry: development of technological innovations in concert with corporate partners; (3) science for science: promoting the advancement of technical sciences by means of excellence in important avenues of investigation and educational innovation. Twice Eindhoven provides high-tech business centres for innovative enterprises with lively entrepreneurial networks. Twice Eindhoven operates four cutting edge business centres situated at Eindhoven’s High Tech Campus and TU/e Campus. These centres presently accommodate well over a hundred companies. Urban Xchange is a consultancy agency adept at innovative zoning development with particular attention to identity, concept, and development strategies. 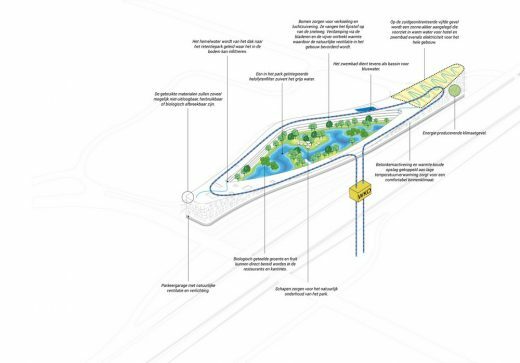 Urban Xchange is currently involved in the transformation of Utrecht Central Station district into a new city centre environment, as well as developing a strategic outlook on the northern banks of the Zaan and IJ rivers in Amsterdam and Zaanstad, respectively. 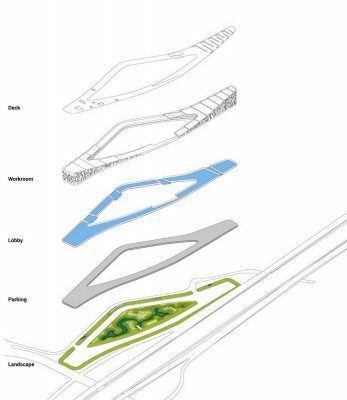 In the Eindhoven region, Urban Xchange has been outlining sweeping vistas of Brainport Park, the Brainport Industries Campus, and the Ekkersrijt working grounds. The present collaboration and its overarching project are supported by Veldhoven municipal authorities and Brainport Development.